This episode brings you our 2014 SCMS Conference preview. Bill interviews programming chair Angelo Restivo about how papers and panels are selected for the conference, then scheduler Bruce Brasell tells us about putting together the program (be sure to take a look at the photos of Bruce's less-than-catproof scheduling system below). Then Seattle locals offer suggestions on what to see and where to eat in Seattle, followed by Chris and Michael's own recommendations. See you in Seattle! SCMS uses state-of-the-art technology to plan the annual conference. I can haz panel slot on Friday at elevenz? Jason Mittell's blog post, "A Few Thoughts on Improving the SCMS Conference"
A good article in the Chronicle on "boutique conferences"
Closing music: Perry Como’s "Seattle"
And finally: Why do Seattleites hate both bumbershoots and brollies? Christine Becker: Welcome to Cinema Journal presents Aca Media and I'm Christina Becker here with my cohost and compatriot, Michael Kackman. Christine Becker: [00:00:29] Michael, it's Episode 13. Are you superstitious? Are you superstitious? Should we. Damn, sorry. Should we be. Yeah, see, I can't even get this out. Episode 13 is starting disastrously. Michael Kackman: I'm feeling pretty good about it, though. Michael Kackman: I'm trying to stay optimistic and I think we're going to pull this off. Christine Becker: [00:00:59] Okay. We'll see, because we had a great collection of SCMS-related information. Michael Kackman: Indeed. This is the primer of getting the most out of the conference. Christine Becker: Because it's coming up just a few weeks from now and we wanted to help equip everyone with the info they need to make it an even better experience than ever before. And even looking toward next year's conference in terms of prepping proposals and all of that, we've got some information that we think will help you out. What we specifically have is a two interviews from our coproducer, Bill Kirkpatrick. [00:01:27] We talked to two key people involved in setting up the SCMS conference, that's Angelo Restivo, the SCMS program chair, and then Bruce Brasell, the SCMS conference schedule. So you're going to loads of really helpful information from these interviews. And then I also produced a segment with the very generous help of some folks on the host committee about some key Seattle attractions for those of us out-of-towners coming in for the experience. Here we go, lucky Episode 13. Let's make it happen. Bill Kirkpatrick: Hi, I'm talking to Angelo Restivo. Angelo Restivo is associate professor in the department of communication at Georgia State University and he is also a member of the Board of Directors of the Society for Cinema and Media Studies and the chair of the program committee for SCMS this year. Angelo, welcome to Aca Media. Angelo Restivo: Well thank you, I'm glad to be here. Bill Kirkpatrick: So in preparation for the conference coming up in March, we just wanted to chat with you a little bit because I know a lot of our members are interested in and have questions about exactly how does the process work. We send in our submissions in August and then several months later we get a yes or a no and then a month or two after that we get a slot on a program, so the whole thing seems like a black box that we hope you can illuminate for us. Angelo Restivo: [00:02:46] Sure. First of all, in our spring board meeting or at our spring board meeting, we put together a program committee, and the program committee this time had 22 members, so we ended up with 11 reading pairs. It turns out that each reading pair will get assigned somewhere around 120 to 130 either open call proposals or panel proposals. [00:03:16] For the open-call proposals, we divide them up according to the categorizations that the author of the proposal gives to us. We have the divisions aesthetics, philosophy, sociopolitical critique, technology, industry, historical, archival and audience. And so each of those in different areas will go to a different reading pair. The thing is, though, that for social and political critique, we always get about three times the number that we do in the other categories. [00:03:48] So, for example we had somewhere around 360 social political critique open call proposals, whereas in the other categories they averaged around 120. So we have three reading group support sociopolitical critique, but for the others, we have one. Then we have three reading groups for the pre-constituted panels, because we got about - well, this time we got about 347 pre-constituted panel proposals, so that added up to between 110 and 120 per reading group there. [00:04:23] So the actual workload is heavy for these people who are volunteers. I mean, this is all volunteer work. Bill Kirkpatrick: It sounds like a ton of work. Angelo Restivo: Yeah, it's a ton of work, and it's pretty evenly divided. So in general, you know, we try to put together reading pairs whose work interfaces with that particular area as well as we can so that we have people who are pretty expert in the area reading. [00:04:53] Now, for the pre-constituted panels, since we don't divide those up into areas, we have to rely on kind of like a general knowledge of all of our volunteer readers to be able to handle those. But even there I asked program chair will steer certain pre-constituted proposals to one reading pair, and others to another reading pair depending on what I know of the expertise of the group. Bill Kirkpatrick: Are the proposals anonymous or to the readers actually know the people who are submitting them? Angelo Restivo: [00:05:24] We know the names of all of the submitters. What we do is we go through and make sure that there are no conflicts of interest, like someone having to evaluate their spouse's proposal. But besides that, there's a sense that, you know, once the names are there, everyone, especially everyone on the board knows everyone else in the field to the extent that everybody is going to get assigned proposals from people whose work they know, who they socialize with that SCMS and so on. [00:06:00] So that's kind of inevitable and we just have to assume that there's going to be a certain level of, well, a high degree of professionalism involved when you accepted the job of evaluating. Bill Kirkpatrick: Could you say a little bit about what reviewers are looking for? We could frame it as a kind of public service announcement. Here's how to improve the chances of your proposal getting accepted. Angelo Restivo: [00:06:23] Sure. And I think that there are some criteria that go across the board are others that are specific to, for example, pre-constituted panels. To begin with, though, is there a clear argument? A pretty obvious one there. Is it situated well within the existing literature? Is it making an original contribution to the field? [00:06:48] Is really my thing it was two years ago, we eliminated one year the bibliographic requirement that you put in bibliographical sources proposal, and we quickly, the next year, reinstated it because we found out how valuable it was. So for example, if a proposal was making an argument in an area where scholars X and Y have made really important contributions in the last two years and we don't see it anywhere in the proposal, nor in the bibliography, then that would raise a red flag. [00:07:24] So the bibliographic listing for your proposal is really an important piece. Now, with pre-constituted panels, you know, we're looking for those with strong individual paper proposals, but we're also looking for a through line in the panel. Is the panel itself making a clear argument or intervention rather than being just a potpourri of essays about X. So we want to see the overarching panel proposal telling us something broader that the four papers are all engaging with in various ways, but not just summarizing those four papers. [00:08:02] And then with workshops, we're looking for topics that clearly benefit from the workshop format, and we really do expect the proposal to make it clear how the workshop is going to exploit the format, because sometimes we get workshop proposals that are really panels in disguise. Those are going to get declined. So as I say, every reading group consists of two people who read every proposal that they're reading independently and rank it on a score of 1 to 5. [00:08:30] The idea here is that a 3.5 average is automatically going to get programmed. A 3 is kind of like a score that a reader would give if he or she is unsure about the originality or the coherence or whatever of the proposal. So the 3.5's and higher get programmed. After that, we end up with probably 70 or 75 panel slots that are still open, and that's when the program chair goes in and looks at the 3's. [00:09:05] Because a 3 isn't necessarily going to be a bad proposal, it's just going to be one that fell in the middle. So the program chair, at that point, will go in and look at the 3's and start programming the best panels and the best open call papers out of those. Bill Kirkpatrick: How frequently are there vast differences between the ratings that the two readers give to the same panel? Angelo Restivo: [00:09:31] Well, part of what I do as program chair, or any program chair does is a set out instructions and guidelines are for the reading pairs. And one of the things I say is it's going to happen eventually that you have a one-five split. This is why you need to have Skype conversations or phone calls after you've been ranking for a while, because I want you to resolve those one-five splits so that you're both on the same wavelength in terms of how you're evaluating. [00:10:01] So they'll begin to see certain discrepancies come up, and then I'll have a phone call or Skype conversation in order to reconcile the way that they're doing the ranking and re-rank, if necessary. I think that by the end of the process, everybody's criteria are more or less standardized. Bill Kirkpatrick: In terms of numbers, do you have, from the scheduler, do you have, "Here are the number of slots we have, give me that many panels." 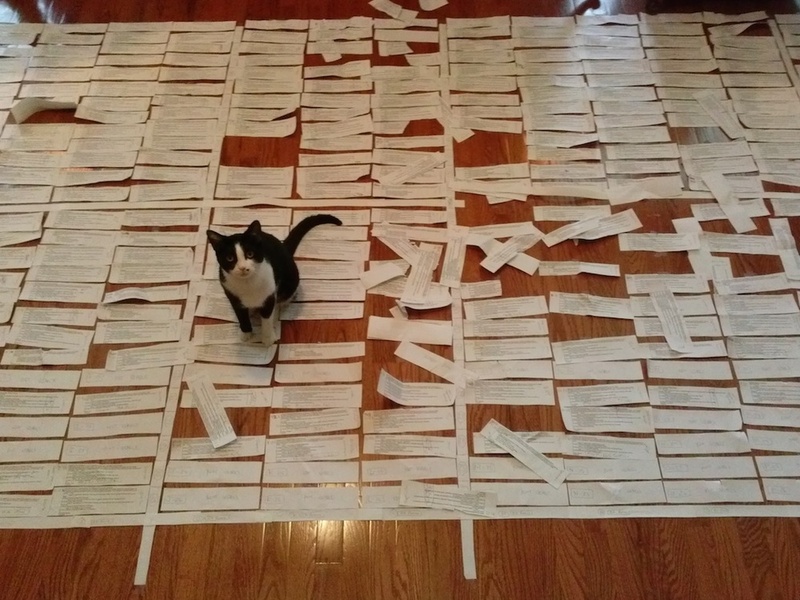 Or do you say to the scheduler, "This is how many panels we can create out of the submissions that we have." Angelo Restivo: [00:10:38] Yeah, you're raising a good point. So first of all, I should stress, there's no kind of like rubric that is supposed to get 20 percent fives or 20 percent ones. There are no targets. In the number of the panels that we can run really depends on the hotel space and the number of rooms we can get as well as the number of days where running the conference, which I assume is going to become something will talk about later. [00:11:09] It just happens - it's happened that there's been a nice synergy so that we've been able to accept all 3.5 and higher ranked proposals and end up with a surplus of about 75 to 80 panel slots, which is really good, because then we're able to go in and look at the various proposals that are in the middle and get the best ones programmed. Bill Kirkpatrick: So one of the questions that comes up quite frequently, and you sort of hinted at it just a minute ago, the question of a four or five days for the conference. It was four days. We've expanded it to five days. That means more people have an opportunity to present, but it also means that there are greater challenges for individual scholars to attend the entire conference. It means that perhaps the conference is a spread a little more thinly. What are your thoughts on that and what are the program committee's and the board's thoughts on that versus five days? Angelo Restivo: [00:12:03] Yeah, now this has been a subject that the board has constantly had to wrestle with. Now, remember that the five-day conference was originally an experiment and we did it in LA for the 50th anniversary because we had to accommodate the papers from the previous year's disaster in Tokyo, and that was the rationale therefore moving it to five days. But then we kept it experimentally and so far we've been feeling like it works. [00:12:35] Now, we know that it drags out the conference, that the conference can be grueling at five days, but in terms of the argument that if it's a four days, you could see the whole conference, with 24 to 26 panels going on at any one time, no matter how many days it is, you're constantly aware of the fact that you're only seeing a fraction of what's out there. You can't do anything about it. If we moved it to four days, I don't think that would resolve that problem. [00:13:06] It might mean that people could be there for the entire duration of the conference, but I don't see that there's that much of a distinction in terms of missing or not missing papers that you want to see. The downside at this point, I think, and I'm speaking for myself here, our acceptance rates are getting lower and lower as percentages every year, across the board. [00:13:30] And this is because our submissions are increasing I wouldn't say exponentially, but since 2008 in Philadelphia, our total numbers of submissions have nearly doubled, and this is in every single category; workshops, open call, pre-constituted. So that means, for example, that just from last year, Chicago, to this year, Seattle, our pre-constituted acceptance rates went from 83 percent to 76 percent. [00:13:59] Our open call has gone from 61 percent to 54 percent. Given that, as a professional organization, we really want to offer our members as much opportunity as we can for them to present their work, I think that going back to four days is really going to make the rates of decline papers and panels skyrocket and it's not going to be good for the organization or our members. People who are on the tenure-track, who needed to be accomplishing, graduate students who needed to make connections. Bill Kirkpatrick: No, some societies have, instead of abstract submissions, they have full-paper submissions. And clearly that would increase the workload. Has there been discussion about using the sigs more or the caucuses more to pre-vet papers? Angelo Restivo: [00:14:47] Okay, well it seems like those are two separate issues, because the whole paper issue is one issue, and that hasn't really been discussed that much during my time on the board. However, having sigs and caucuses involved in the vetting of proposals or solicitation of proposals has been. It's been a perennial topic. So far, we said no. [00:15:41] The idea here was that anybody in any area should be able to make clear to whoever the readers are the value of their work to the field and that makes the conference a conference for and about all of us and it doesn't sort of reify certain specializations. But the other thing is the board has always said we rely on volunteers to be on the program committee, and we would love to have people in the sigs and caucuses volunteer to be members of the program committee. [00:16:17] And if they are, then they're probably going to get channeled to be reading proposals in the areas that they're involved with in their sig. Bill Kirkpatrick: There was a recent post by Jason Mittell talking about some of the ideas that he has for the SCMS conference, and one of the big ones that caused a lot of discussion was the idea of eliminating the open call. The open call on the one hand allows more opportunity for junior scholars and those without strong social networks across institutions to get their papers in, but it does add to the volume of papers, it adds to the length of the conference, perhaps. What sorts of discussions have happened around open calls versus pre-constituted panels? Angelo Restivo: [00:16:58] Yeah, I'm familiar with Jason's post, and I appreciate his desire to get the best conference that we can. In terms of eliminating open call, that has never been anything that the board, as far as I know, has thought about. I think the open call is important not only for junior scholars, but graduate students as well. [00:17:24] I remember presenting at SCMS all the way through my doctorate studies. Now, you could argue that if we eliminated the open call, that might force more of our members to engage in a scholarly exchange before the conference, for example. And, in fact, I think you had mentioned the high rate of acceptances and pre-constituted panels. I think the reason why the rates are higher they are than they are in open call is simply because this collaboration beforehand constitutes the kind of peer review that happens before it even gets to the readers and the conference programmers. [00:18:00] You know, that's a plus, but part of the beauty of open call is that it puts people who might not have been aware of each other's work into context. And you'd be surprised at the number of senior scholars who submit to open call. I think the standard wisdom is that they all do pre-constituted panels or are respondents. They get asked to be respondents and so on, but we get a number of open call proposals from senior scholars. [00:18:25] You know, the other argument that I heard, and I think Jason made this argument is that the open call leads to artificial panels. You know, like "Recent Developments in Media Studies" kind of thing. But this is true only in a fraction of the panels that we form from open call. You know, the program committee works really hard to put together coherent panels, and I would challenge people to go through the program and try to pick out which panels were created from open call and which were pre-constituted. [00:19:00] I bet they would be wrong half the time, and I think part of it is because, you know, in a field like ours, there are certain questions, there are certain methodologies, there are certain texts that are just on the table at any particular moment or in any particular year, so that you're going to be able to put together coherent panels out of open call papers. I know for a fact that we have a panel on Zero Dark 30, just a text that garnered a lot of attention and we got a lot of open call proposals there. [00:19:34] That's just one example, but our reading pairs work hard to put together really interesting panels, and for the most part, the open call papers are really placed well. Now, it's such a complicated jigsaw puzzle to put together the schedule that yes, at the end of the line, we end up with 12, 14, 16 open call papers floating around and we can figure out how to fit them anywhere. [00:20:05] So yes, there is going to be, again this year, a Recent Developments in Media Studies panel, but it's a fraction of the panels that get put together through open call. Bill Kirkpatrick: I think one more question, then, the issue of publishing the abstracts. One common complaint, and in fact I'll confess it's one of my complaints, has been trying to determine what's the best use of your time based solely on the title of the talk or the reputation of the scholar or what have you. It seems like the technology should be available; hitting send and uploading stuff. I'm guessing it's more complicated than that. Angelo Restivo: [00:20:45] Well, I know this is a subject that's been taken up by the board in the years before I got on the board, and I think there are two issues involved, and one of them is logistical. Building the infrastructure to do it, but even more importantly having the personnel to put the time required to get everything online I think is one issue, but that's probably not a deal-breaker, although do remember that most of the work that's done for us is volunteer. [00:21:13] But I think the other thing, there's a feeling that some scholars might not feel comfortable putting not-yet-published, original work online. Perhaps if we ended up wanting to move in that direction in the future, we'd want to probably get a feeling or a sense from the members. And I know it's probably going to be split because there are some people who are totally involved in open-access publishing and others aren't. So, I mean, I think it's a delicate road to negotiate. Bill Kirkpatrick: I hear that I'm more invested in the open the side. I think that abstracts are useful and helpful to people and they will be presenting the talk, after all, but even perhaps an opt out possibility. Okay, we will publish all the abstracts unless you take some sort of action to opt out. What sorts of possibilities there might be, something, again, for the members to let the board know about? Angelo Restivo: [00:22:10] Sure. I think it would be, but again, I can't speak for the board on that issue. I'm just sort of summarizing what has gone on in the past. Bill Kirkpatrick: So, are there any other issues or concerns or just sort of interesting bits and pieces of this that we haven't talked about that you think the members and the listeners might be interested in? Angelo Restivo: [00:22:31] Maybe one of the things that we didn't talk about is some trends. One of the things that's great about being on the program committee is you get a really broad picture of what's going on in the field. And of course, this is going to be impressionistic, but it seems to me that, to quote Barb Klieger from last year, there's a lot of attention to the M in SCMS, and that's increasing. [00:22:54] One of the things that was really striking to me was sound studies, where for a long time, sound studies was kind of like the under theorized element of our fields. I saw so many open call and pre-constituted papers and panels dealing with sound, voice, noise that it was very heartening. We're also seeing increased work in a video games, digital culture as well as in the areas that you would expect us to cover, you know, very well from our history. Like international cinemas and so on. [00:23:30] I think the program is very exciting this year, and Seattle is a great town. So I'm looking forward to seeing everybody. I hope the people that I don't know will come up and shake my hand and say hi. Bill Kirkpatrick: So, Angelo, thank you again for the work that you do and also to the readers who volunteer their time, I know it's a huge task of going through these hundreds of submissions. And thank you, as well, for explaining it to the listeners of Aca Media. Angelo Restivo: [00:23:57] Well, thank you. I was really happy to have the chance to talk to our members about the process and I really want to thank the membership of SCMS for being such an incredibly smart group of people; the people who make our conference what it is. Michael Kackman: Well, that was a good interview. A lot of good information there. Christine Becker: Yeah, definitely. Especially things that we often grumble about because we don't really know what's going on. Michael Kackman: [00:24:29] Yeah. It's a big organization, but it's not actually that big in terms of who's actually running things and how things are put together, and so I think the biggest tip that comes out of all of this for me is if you are curious about something, ask, and if you want something to happen, go to the members' meeting and ask questions. Christine Becker: Yeah. Can you say little bit more about the members' meeting, because I think if anyone listened to that segment and want to know more about what's going on with SCMS or wants to interact with the board and present some opinions about the future direction of SCMS, the members' meeting is the place to go, right? Michael Kackman: [00:25:01] Yes, absolutely. And that meeting is a Friday, March 21. It's from 11 to 12. It tends to be a really good opportunity to meet people. You can put names to faces if you haven't met some of the board members and it's a great place to bring up questions and comments. It typically tends to be. I haven't heard yet this year, but they tended to offer lunch and right now one of the big new development is moving toward having a professional executive director who runs things. I imagine that will come up at the members' meeting and that will be a great opportunity for people to give some feedback and learn more. Christine Becker: [00:25:33] Yeah. Well, we're not done yet with great SCMS information, because Bill went the extra mile and got a second interview. We've heard now how all of our papers get picked, now how do they all get scheduled? Bill went to find out. Michael Kackman: It's like one of those - you know those GRE puzzles where it's like Susie can't sit next to Bill, those goofy things? So I really have no idea how someone would have the patience to put that altogether, but Bruce does. Christine Becker: Bruce does, indeed. So let's learn more about it. Bill Kirkpatrick: I also spoke with Bruce Brasell, who is an independent scholar who splits his time between New York and Alabama, and he is the one who actually puts the program together. Bruce, welcome to Aca Media. Bruce Brasell: [00:26:23] Well, thank you. Bill Kirkpatrick: So I think our listeners are first wondering how you actually go about doing it. Bruce Brasell: The chair goes through and kind of decides what's going to be accepted into the conference, but we always work with a core number of what we think the total needs to be around. So we've gone from 150 10 years ago to around 430 now, and that's been about the total of the last three years pretty consistent now. So that's how many spaces we have four panels and workshops. And those are laid out over the conference. Not always exactly the same, but typically you can have about 23 every session. It has it to be filled with panels and workshops. Bill Kirkpatrick: So as you're putting the panels into timeslots, obviously you can't ask someone to be in two places at the same time, but beyond that what sorts of criteria or considerations are you taking into account? Bruce Brasell: [00:27:10] The first one would be issues of conflicts of people participating or people that need to be not around for certain times. And the second one would be, of course, the topics in terms of using the basic categories we use disciplinary-wise to prevent overlapping topically. And then the third thing I guess we take it to play would be senior scholars. [00:27:39] We have a question of, you know, we know those are going to be highly-attended, typically, sessions, so those that need to be spread out as well and not overlapping too much. Of course obviously, in every session we'll have more than one senior scholar, but they need to be spread out. And the same thing with the topical. Topically, you try to have everything spread out over the conference. [00:27:59] And I guess, like if you think about generic categories, the conference has gotten so big that now there has to be overlap. There is no way you can really lay it out without overlap, but to try to minimize it within what I kind of think of as traditional disciplinary categories, but also I try to look at what is the topic that year, because that will affect the kind of panels we have. Like one year, because of the topic, all of a sudden there were almost a dozen and a half panels on Festival, which is not a normal thing you would have. [00:28:27] So that year I thought, "Okay, I needed to basically make sure all of the Festival panels don't overlap." So areas that maybe earlier didn't overlap now we have to do overlapping, so we have to overlap on TV panels now. Now, at one point, you could have a TV panel at every session. Now, you have to have multiple TV panels. Similar to the way film does. A digital culture, before you could do one panel every session on a digital culture. Now, digital culture is so big you have to have multiple panels. [00:28:57] And so sometimes people might get upset over the fact that things are overlapping, but the positive thing is it's because of that area of the discipline is growing and, of course, the cinema area is shrinking a little bit. Bill Kirkpatrick: So is all of this by hand? Do you have software help or is this all manual, analog, old-school? Bruce Brasell: [00:29:18] It's a mixture. We have software, but the actual laying out of the conference, you really can't do on the computer system. There's a system of collecting all the data, but what I end up doing is I literally print out everything that's been accepted, cut it out into little pieces of paper and literally just move everything in the living room. I could give you the photograph of my cat. [00:29:43] One year, I laid it out and I was halfway - actually, I got to the end of it, and I've learned that when I start laying it out, I have to take everything on the floor, because if I don't, the cat runs in and just slide straight through it. It's like it's too tempting. Even now that I tape it, the cat will still run through and move a few of them. And so I literally lay it out on the floor and it takes up the whole living room floor. And again, it's not a one-time process. [00:30:13] But you lay it out within my categories and then I start rearranging as I look at each of those sessions. So the way I kind of think of it is it's randomness within organization. So I kind of do them both together, so I'm not at the point where I'd say, other than senior scholars, I'm not looking at names, per se. Senior scholar names I highlight and I look at how they're laid out in the conference, but I leave a certain bit of randomness to it. [00:30:38] And I think a great case would be think about if you're laying out Asian media, I'll say, "Okay, I have four panels or five panels dealing with Korean cinema." Honestly, that's one every day. And then it becomes which one goes on what day, and if I have no senior scholars, well then there's kind of a little randomness there. [00:30:56] Because no one wants to be on a Wednesday, nobody wanted to be on a Sunday, so I put a certain bit of randomness within the system for that determination. Bill Kirkpatrick: So you said you don't really look at individuals, but do you go back and say, "Okay, this person has a workshop on Wednesday and then a panel on Sunday afternoon, maybe we can do something about that." Bruce Brasell: [00:31:16] It's interesting that you ask that question, because I just started doing that this year. Because what happened is last year, the computer system is supposed to catch duplicates. You know, when you put two people in the same session, but unfortunately the computer system is not catching them, so I have to go through. Every time I lay out a session, I have to literally go through the index and find duplications. [00:31:40] But what's been a good about that is as I've been doing it I've been getting more aware of where people are positioned, and I've ended up with people on the first day and the last day of the last conference. It was probably about three or four people. And at that point, it was too late out to do anything. And so this year, what I did is as I was going through it, I made sure nobody had - because nobody was actually on both the last and the first day. [00:32:05] But other than that, then you could be stuck anywhere in there, because then it goes back to it's another manual thing you're doing as you're laying it out. To make one change, once you've laid out, you could spend 30 minutes trying to swap out two papers. And you go, "Okay" - you have to kind of way the benefits to doing something. Bill Kirkpatrick: I have to say, that sounds like a ton of work. Bruce Brasell: [00:32:29] It is, and what I do is I take it and I just - I mean, I would in concentration you just immerse yourself in it and then you just spend two weeks in total immersion. Bill Kirkpatrick: And that's without the cat coming in and messing things up. Bill Kirkpatrick: So yeah, you have to send me a picture of this laid out in your living room. Will put that on the website. I think that would probably give people a good mental image of how their week is being structured. Bruce Brasell: [00:32:55] Another issue is you have to decide what rooms you're going to put which panels in, so you have to kind of predict do things attract a large group? And then you have the issue of on Sundays, what happens is all of the large rooms open up on Sunday because they were used for all the special events during the conference. So when we have the reception and all of those things, the business meeting, those are all held in large rooms that free up on Sunday, so Sunday we all of a sudden have these rooms that hold 200 people. [00:33:24] And it's kind of like most of these panels are not going to really attract that larger crowd, and then who get to the uncomfortable position of having a panel with a small group of people in a humongous room. And again, that goes back to the logistics of the hotels, the flow of the conference that is weird and happens every time. And so that's another guessing game is figuring out - you're estimating what you think the size of the audience will be. [00:33:52] One thing I did one year and I'd like to go back to it is I would actually leave all of the topics in the same room. I did that one year, and then I tried to only move the ones I thought needed to go to a large room. I would move them, but even doing that you still have to do some moving around because you know you're going to have a panel that needs to be in a large room. Even if you try to keep, topically, them in the same room. So I tried that one year and it didn't always work as well as I thought it would. Bill Kirkpatrick: What would you say was the biggest scheduling disaster that you recall? Have you ever had any? Bruce Brasell: [00:34:29] Yes, I had one three years ago, and I was so embarrassed afterwards. And I had scheduled a workshop and a panel at the same time that had overlapping that once it was pointed out to me, I realized. Somebody had just died that year. It was a black film panel. I think the workshop was more like a memorial or something, and I put them in the same session. As soon as somebody who was on one of the things called and said, "These really are the same," it actually was very embarrassing because I looked and I thought, "Oh, this is so obvious. I can't believe I did this." [00:35:08] And there's always this room that you're going to, because you're dealing with so much at one time and you're trying to get an overall picture of so much, and it's as if you look over things and so many times that you actually don't see what you're looking at. Bill Kirkpatrick: So is there anything else that you would like the members to know or be thinking about as they experience the conference, as they're looking at their own schedule and the papers and some panels that they're trying to get to, what would you like them to kind of keep in mind each year? Bruce Brasell: [00:35:38] Another thing I started this year, as I'm having to manually go through the index now after each time I lay out a session, I have to manually go through and look at the index, and I have noticed where people had panels back to back or workshops back to a panel. This year, for the first time, I actually went through, when I found those, and I put them in the same room. [00:36:00] So if somebody has that kind of situation, they now actually should be staying in the same room that they were in before. I just couldn't get it to move to put another session between it, so that was the way I resolved that situation when it came up. So that's the first thing this year. But I guess is directly SCMS has been what people would call a boutique conference. And boutique conferences are very small. You don't have to worry about overlaps and those kind of things. [00:36:29] And what's happened is SCMS is no longer a boutique conference. But we are not a large conference. We're not like MLA. Actually, I guess you could say we're like an adolescent and we have adolescents' bodies, you know how they are kind of odd, and that's the stage that I think we're at as a conference. And we're probably going to always be at that stage, would be my guess. And so what does that mean that we're always kind of having these adolescent bodies as a conference? Bill Kirkpatrick: That's a great metaphor. Thank you for that. I will speak for the membership. That's quite arrogant, isn't it? But I will speak for the membership to thank you for the thoughtfulness and the care with which you put into this process. Bill Kirkpatrick: I always have a great time at SCMS. I'm looking forward to Seattle and yeah, thank you very much for talking to us here in Aca Media. Christine Becker: Another really great to view, and you will want to see the photos. Bruce gave them to us. Michael Kackman: [00:37:37] They're rare and precious photographs from inside the bunker where all of this work is done. Christine Becker: Yeah, you have to see these photos. Michael Kackman: And he's got a really good assistant. Michael Kackman: He's got talent. Christine Becker: Yeah, I only wish I had an assistant that great. Bill later talked to us after doing both of these interviews and he said one thing that struck him from both, because he said the board's attitude, he said he always thought of the conference is kind of a litmus test for quality, this idea of its more prestigious if you reject a lot of papers, but in fact the board wanted to actually accept as many papers as possible and sees the conference as a kind of a service to the membership. So I thought that was a really interesting take away from both of those interviews. Michael Kackman: [00:38:12] Absolutely. Some of these things that seem maybe a little frustrating or difficult, like trying to deal with so many panels on at a time and the lengthening of the schedule, that doesn't make participating in the conference a little bit more of a challenge, but it also expands the inclusivity of it. It's really important to give some credit to them for that, I think. Christine Becker: Definitely. All right, now we got one more segment left and we wanted to try to help out those coming to Seattle, especially those who have never been there before. You have generally very little free time at a conference because the conference is so darn good, but with that free time, then you want to make sure to maximize it. And so I asked for help on this from Jennifer Bean, who is Associate Chair of comparative literature and cinema and media studies at the University of Washington, and I wondered if she could hook me up with a few scholarly locals in Seattle who could help fill us in on local areas of interest at SCMS Seattle. [00:39:00] So she delivered some very helpful people to me. So here I offer you audio clips from UW grad students Kathy Morrow and Verena Kick, plus I'm reading some email tips that I got from UW professor Claudia Gorbman. Christine Becker: First of all, it's SCMS. You will need coffee. Luckily, you'll be in the Seattle. Since Seattle is the home of Starbucks, you are never far from one when you're downtown, just ask anyone. But for the original, historical Starbucks, walk down to the Pike Place Market, turn right and walk a couple of blocks on Pike Place. [00:39:39] Also a long Pike Place is all kinds of eats, to bakeries including one a very good French one called Le Panier with good sandwiches as well as a real of French pastries and bread and coffee as well as standup windows for gyros and other ethnic foods. Female Voice: [00:39:51] When it comes to a quiet café to get away a bit from the hotel and maybe to talk with a publisher about a book project, I would recommend the Bell Epicurean on Fourth Avenue between University and Spring Avenue. It is a French bakery that has delicious pastry and macaroons. It might be busy during lunch time when many office workers to stop by, but later in the afternoon, one can easily grab one of their small tables and have a nice chat. Christine Becker: [00:40:17] One other handy place for coffee is in a Pacific Place, an upscale shopping center one block from the hotel. The ground floor atrium there is a nice for coffee, cold drinks and light eats. Speaking of places to eat, Pacific Place has several restaurants, too. Most pleasant is Il Fornaio, an Italian restaurant at the far end of the main floor. If you want a real Seattle experience for lunch, find the café in the Pike Place Market that serves clam chowder. Go upstairs for a tiny table with an incredible view of the harbor and ferries as you slip your chowder or eat burgers. [00:40:47] Also a very congenial restaurant is the Pink Door at 1919 Post-Alley, great for an intimate or festive dinner. Female Voice: Regarding lunch, I would definitely recommend Coffee Yum, which is really close to the conference hotel. Coffee Yum started out as a small vegan and veggie restaurant in Eugene, Oregon out branches, as well, in Washington state. Coffee Yum all about its yum sauce, which is based on a mixture of garlic and peanuts, and thus it is very yummy. [00:41:17] Usually, you order a yum bowl there, which means you get a variety of veggies together with some rice and cheese and, of course, the delicious yum sauce. When it comes to dinner, the Wild Ginger is a place that I would definitely recommend. It is an Asian restaurant and a settee bar. The staff there are always incredibly friendly and accommodating, and the food is exceptionally good. Christine Becker: [00:41:38] Also, Le Pichet at 1933 First Avenue is a delightful, small, thoroughly French bistro serving classic fair, fantastic for both lunch and dinner. A little bit more of a hike, but worth the 20 minute walk or five minute taxi for the best food in Seattle is the Tilikum Place Café near the Seattle Center, i.e. near the space needle. Reservations are definitely necessary for lunch or dinner. It's got a brilliant chef, a great atmosphere. It's small, so not appropriate for a group of more than four people. [00:42:04] Seattle also has a lively Chinatown, which has its Southeast Asian, Japanese and Chinese areas. Have someone show you the nearest entrance to the bus tunnel, hop a free ride to Chinatown and explore and eat. Okay, so let's imagine you just deliver the paper of your life. Where you had next to celebrate? Female Voice: [00:42:24] Some of my favorite places are relatively close to the hotel, if you go across I-5, just up there on Pine and Melrose is Pinebox. They have a great craft beer list, good food, relatively big tables if you're not there too late. But also right there in that area is Woody's, which has, I think, the best burgers in Seattle. [00:42:45] After you've delivered a great paper and want to celebrate your success, you should head straight to Capitol Hill and it to Art Fellows, which is an awesome restaurant if you want to have good food and good drinks with a nice atmosphere and celebrate with three, four, five or even more people, this is definitely the place to be. Christine Becker: Okay. It happens once in a lifetime, you deliver a bad paper. Where do you go to shake off the blues? Female Voice: [00:43:10] Well, what I would do is I would walk over - close to the hotel is Pacific Place Mall, and on the second floor they have a Trophies cupcake stand muscle I would get myself a cupcake and then I would take my cupcake out of the other entrance of the mall on Olive, walk up a couple blocks, and on your right there is a doggie daycare with huge windows. The whole walls are windows, so you can look in and see the dogs, and it's really cute and I think would make anyone feel better. [00:43:40] Fun fact; Seattle has more dogs than children, so we love our dogs here. Female Voice: After you've delivered a disastrous paper and you want to forget it ever happened, you should head straight to Capitol Hill, either to Lost Lake, a 24-hour diner with excellent food and a cheap beer to drown your sorrows, or you and a pal should head to Pie Bar, because pie makes everything better. And pie-tinis will let you forget any mishaps you've had. Christine Becker: [00:44:10] If you do get a chance to get away from the conference for a half day or so, here are some ideas. Walk all the way toward the water and stroll along the waterfront. See the places with fish and chips are there, curiosity shops. It's touristy, but pleasant to breathe and the sea air and the bustle of the talks. For galleries and glimpses of old Seattle, hop on a free bus to the Pioneer Square area or walk there down First Avenue. Female Voice: [00:44:32] I would say skip the space needle. It's overpriced and touristy and it's, frankly, just as good to look at from the outside than from the inside. But if you did want to get some different views of the city, one place that's kind of fun is Smith Tower, which is an older building over in Pioneer Square. And it's definitely not as tall as some of the places, but it has some good views and it's kind of a quirky, fun building. Christine Becker: [00:44:58] Another option is to find the Washington state ferry dock on the waterfront and for a few bucks stuck on a magnificent ferry ride to Bainbridge Island and back. It's a half hour each direction. Imagine yourself in five easy pieces, on a nice day especially, gorgeous views of water and the mountains. On the ferry, you can fret over your paper, if you haven't delivered it yet. [00:45:17] If you have time for an hour in Bainbridge Island, it's an adorable town with bookstores and good eats, just one block up from the ferry. A goofy tourist thing to do is to take the monorail. That's right, monorail. Built in 1964 the World's Fair, and still running, which takes you from Westlake Center, which is just a few blocks from the hotel, to the Experience Music Project right past the space needle. The EMP, Experience Music Project, is Frank Gehry's weird and wonderful museum of popular music. It also houses a sci-fi museum. [00:45:48] Speaking of other media studies-specific things to do, you can head to possibly the best video store remaining in the United States, which is Scarecrow Video. This is not within walking distance, but the Sheraton desk can point you to the right bus to get to the University District. Female Voice: I would recommend a living computer museum. The lecture presents the meaningful milestones in the evolution of computers, particularly from the 60s to the 1980s. Their vintage computers are restored to working conditions, so visitors can interact with them in a variety of ways. [00:46:17] For queer spaces, I would say check out what is going on at Rebar, where they do drag shows quite frequently. In addition, the Three Dollar Bill Cinema has a mix of campy to political films and [sinoke]. If the weather is nice, I would recommend to take half a day off and come see the cherry trees, which will be in bloom on the campus of the University of Washington. Even better, take the time to walk to Gas Work's Park starting at the University of Washington's campus. [00:46:50] It is about a 30-minute walk, but you are rewarded with a lush, green park centered around a former Gas Work, and of course you are also rewarded with a great view of Lake Marion and the entire skyline of Seattle, including, of course, the space needle. Female Voice: A couple of random things about Seattle that I kind of wish someone had told me before I moved here. First, you'll notice Seattleites weights at intersections. So they don't cross against the light, pedestrians, which is a little bit strange, but it's one of Seattle's things. [00:47:22] One of the other things that is a bit odd is, so if you're at a bar that doesn't have servers and you need to go and just order your drinks from the bar, Seattleites line up. It's pretty standard instead of just waiting around the bar and expecting the bartender to come to you. Everyone gets in a very civilized line and waits there to order their drinks. It's strange and it's worth knowing. Otherwise, I would say mainly just get out of downtown, go see some other part of Seattle, because I think the rest of the city is more interesting, really, than downtown. Michael Kackman: Yeah, I know. I'm doomed. My day is over. Christine Becker: If you need to hear the whole thing we do have a link to it on our website, and every single place you heard decided in that segment is linked to on our website, Aca-Media.org. And big thanks again to Jennifer Bean, who helped to connect us with Kathy Morrow, Verena Kick and Claudia Gorbman. [00:49:18] Also, a big thank you to Adam and Derek Fairholm for permission to use portion of the music Derek composed for Adam's documentary film Pope Michael as the background music. Michael Kackman: That was a good catch there. Christine Becker: Yeah, it's really good stuff. I have just a few tips to add, and this is courtesy, actually, of Anne Helen Peterson's Facebook page. She teaches at Whitman College in the Pacific Northwest and has plenty of friends up there, so she asked them for suggestions for things to do in Seattle, so I thought I would finish off this segment by throwing a few of those things out. [00:49:45] So first of all, the sites people recommended, the Olympic Sculpture Park, the Washington Park Arboretum, so lots of nature spaces to think about how your paper went. Ballard Locks. Michael Kackman: The Ballard Locks are actually really great. Ballard is a great old kind of working class port. There's some good pubs up there and it's fun to go check that out. Christine Becker: [00:50:04] The Fremont Troll, which is apparently kind of an art installation, a statue of sorts, of a troll under a bridge. Michael Kackman: Yeah. It's under the Fremont bridge. The whole Fremont area has become a little bit more gentrified than it used to be, but it's kind of a cute little area down between UW and Lake Union. Christine Becker: There's also Haunted Pike Place Market ghost doors, and I do love a good ghost tour. Every town I go to, I love to do a ghost tour. Michael Kackman: I wonder, they probably go into the Seattle underground, too. There's a whole underground Seattle, the sunken city. Christine Becker: [00:50:31] There's got to be plenty of ghosts down there. Also, I don't know if Bruce Lee and Brandon Lee Seattle, but you can find their grave sites. A couple of additional restaurant recommendations; Westward Staple and Fancy, Boat Street Café, Ray's Boathouse and Paseo and Purple Café and Wine Bar downtown for more upscale dining. Michael Kackman: Those are good. Christine Becker: And for drinks, the happy hour at Sazerac, I'm told. Michael Kackman: Well, that doesn't sound bad. Michael Kackman: There's a good little pub, the Two Bells Tavern. It's on Fourth down towards the Space Needle. It's a good little pub with beer and chili and stuff like that. You know, not fancy. Christine Becker: [00:51:06] Well, we SCMS people, we don't do fancy. We're all a down to earth. Christine Becker: All right. One final tip, to get to the hotel and back from the Seattle airport, you probably saw that SCMS set up a deal on a shuttle service. But Annie Peterson point out and even better, in other words way cheaper option is to take the Seattle light rail. It starts at the airport, leaves every 10 minutes or so and about 40 minutes later you'll be at the last stop, which is called West Lake, so you can't miss it. Just wait until the thing stops fully. Michael Kackman: That's such a great plan. Christine Becker: [00:51:35] It's only three blocks from the SCMS a hotel, it only costs a few dollars. Just one warning. Those three blocks to the hotel, apparently, involves some hilly terrain, so if you have a ton of luggage or any physical challenges, the directional may work better for you. But otherwise, it sounds like Seattle light rail is the way to go. Michael Kackman: That's so amazing that that's finished and in service. That's great. Don't forget your bumbershoot. Michael Kackman: Your bumbershoot. Come on, you're the anglophile here. Christine Becker: I know brolly. I don't know what a bumbershoot is. Michael Kackman: It's a brolly. A bumbershoot is a brolly. You know, we'll mark you hopelessly as a tourist because Westerners, just as a general rule, don't use umbrellas. But go ahead, take it with you. Christine Becker: [00:52:12] I don't mind looking like a tourist. I am one. I embrace what I am. Michael Kackman: There you go. Christine Becker: Once again, all of the links for everything we just mentioned are on our website, so go hit that, aca-media.org, and you can find your way to any of the stuff we've talked about. You can also find us on Facebook and on Twitter at aca_media. So we are now on to SCMS, Michael. Christine Becker: Yeah. And we can't wait to see all of you there. And please, feel free to come up and talk to us. Of course, you may not know what Michael looks like, but check the About Us page to see how he's looking this month. Michael Kackman: [00:52:44] I'm actually kind of curious to see how I look in this month myself. We'll be wandering around with our tricorder-looking devices, capturing audio from the conference, so if you have any comments that you want to share with the larger public, find us. Michael Kackman: Aca Media is produced with the support of ISLA at the University of Notre Dame as well as the Department of Communication at Denison University. Christine Becker: And we also like to thank the support of SCMS and Cinema Journal. And thank you to the episode participants, Angelo Restivo, Bruce Brasell, Kathy Morrow, Verena Kick and Claudia Gorbman. Michael Kackman: Our co-producers are Bill Kirkpatrick at Denison and Todd Thompson, whose golden ears make it all work. Christine Becker: [00:53:21] And we would like to thank our production assistant, Jillian Meisner.